What five stars from Bonanza appeared on The Rifleman? Two of them appeared twice.....do you who they are? There were a number of well-known guest stars during the first season, many of them went on to have shows of their own. There were five actors who appeared on The Rifleman that were regulars on Bonanza — do you know who they are? 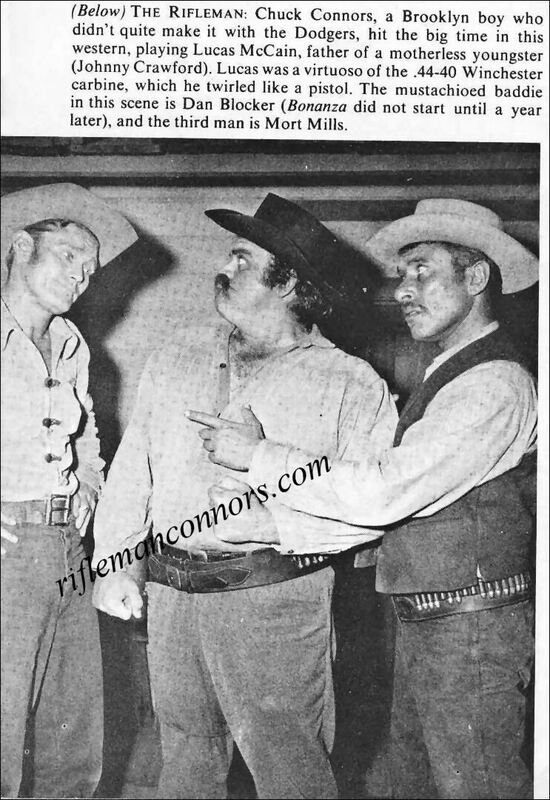 Michael Landon who appeared in End of a Young Gun as Will Fulton the young gun who wanted to go straight ― The Mind Reader as Billy Mathis who was accused of killing John Hallager, Lucy's father. Michael Landon also appeared with Chuck Connors in Tales of Wells Fargo / Sam Bass (1957), before The Rifleman. He went on to play Little Joe on Bonanza. I would say other then Bonanza, his next best thing would be Little House on the Prairie. Michael Landon was born on October 31, 1936, in Forest Hills, Queens, New York. He died July 1, 1991 in Malibu, California of pancreatic cancer. Michael Landon left a legacy of himself and great TV shows for us to enjoy! Dan Blocker as Peter Snipe in The Sister, he was one of Rebecca's brothers. Mort Mills appeared on Bonanza five times. 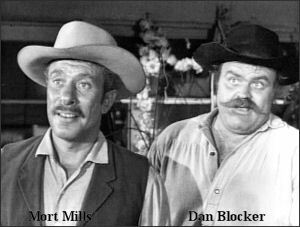 Blocker played Eric 'Hoss' Cartwright on Bonanza. Bonanza was not on the air until a year later. Dan Blocker provided tenderness, strength and comedy for the viewing enjoyment for fans of all ages. Blocker's sudden death during the 1972-73 taping season left a void that could not be filled, and the series ended shortly afterwards. There is a museum located in O'Donnell dedicated to Dan Blocker. O'Donnell is located in the panhandle of West Texas, about 40 miles south of Lubbock, Texas. He started and owned the Bonanza steak house restaurant chain. The Long Goodbye a 1973 movie was dedicated to him: In Memoriam for Dan Blocker. 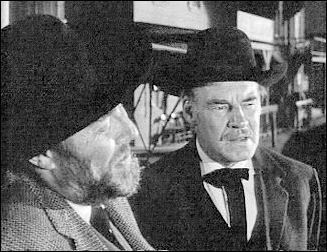 Robert Altman, who had directed many early episodes of Bonanza (1959, had originally cast his friend in the role of Roger Wade, but he died before filming commenced. The role subsequently was filled by Sterling Hayden. Victor Sen Yung was born on October 18, 1915 in San Francisco, California. Victor Sen Yung went on to play Hop Sing in Bonanza. He was on Bonanza from start to finish. 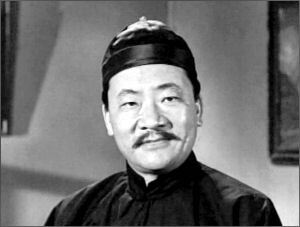 Victor Sen Yung played the role of Number Two Son in 25 Charlie Chan films during the late 1930s and most of the 1940's. Bing Russell played Hode Evans in A Matter of Faith, he was the one who ruffed up Jonas Epps the rain maker and threw the dirt at Lucas. In Seven he played Sanchez, he was one of the condemned murderers who escaped and took over the town of North Fork. Bing also appeared with Chuck and Paul Fix in the 1979 TV Movie, Set This Town on Fire. He appeared in Branded with Chuck in two episodes ― Very few Heroes & The Golden Fleece. He also appeared in fifty-five episodes of Bonanza, fifty-three as Deputy Clem Foster from 1961 -1973. He appeared in The Magnificent Seven and he also appeared on the The Untouchables. He is the father of actor Kurt Russell. He appeared in Overboard with his son, Kurt & Goldie Hawn. He's done a lot of great stuff! I tip my cowgirl hat to you! I'm sure you would remember him best as the no-nonsense Sheriff Roy Coffee on Bonanza. He was on Bonanza for 12 years (1960-1972). He was one of the most versatile character actors in the business. In his almost 40-year career he played everything from cops to gunfighters to sheriffs to gangsters to a judge at the Nuremberg War Crimes trials. He could play a kindly grandfather in one film and a bullying, sadistic killer in the next, and be equally believable in both roles. A great character actor!